Regardless of what profession I am in, I have always valued comfortable feet. In fact, one of the main reasons why I chose ophthalmology was that I preferred doing surgery while seated rather than standing. 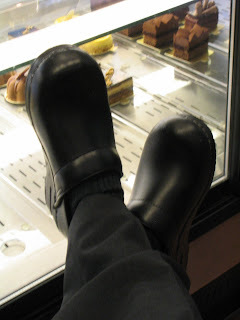 After my first week at Ganache, it was apparent that my previous footwear, which had been cheap gardening shoes that were also used as operating room shoes, was not adequate to prevent achy feet at the end of a working day. The "investment" in Dansko professional clogs was a great decision as my feet are now much happier after a busy day in the kitchen. The House of Clogs on Robson Street had many shoes from which to select and the nice saleswoman gave me a student discount. Yesterday, I was working out front during the mad Valentine's Day onslaught. It was dizzying how busy it became, especially between 4 and 6 pm. The majority of customers were husbands or boyfriends and we were selling as fast as we could. Many items sold out quickly, especially the Valentine's Day pavé and crème brûlée. Because of the extreme rain and heavy foot traffic in the store, by midday, I was mopping up a large puddle which had formed in front of the display case. The experience has taught me a great deal about the challenges of running a successful pastry shop and what planning and streamlining is required to hopefully make things run smoothly. I just wish that I had been wearing my kitchen clogs instead of my regular shoes because at the end of the day, my poor feet were so sore! Posted by Charmaine at 9:30 p.m.